In July 14, Indonesia Pavilion of 2010 shanghai world expo was surrounded by fragrant smelling of coffee. A five-day festival of Indonesian coffee pulled its curtain. 20 coffee companies served visitors with full-bodied coffee, of which the world’s most expensive “cat feces coffee” has become the biggest bright spot, attracting most people’s attention. 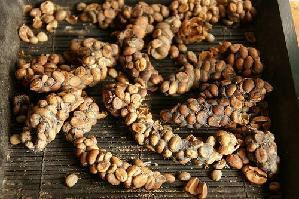 “Cat feces coffee” was called Kopi Luwak in Indonesia, of which Kopi means coffee and Luwak is a wild cat called musk cat. It is reported that “Cat feces coffee” is extracted from the the feces of Asian musk or civet cat after they have aten the local coffee. This coffee will be undergone a strict health procedures, then will produce a unique flavor after drying, baking and brewing. Staffs from Indonesia Pavilion said that althouth “cat feces coffee” sounds weird but its taste is really mellow. However, because raw materials are limited the “cat feces coffee” is naturally crowned as one of the luxury goods. It is revealed that during the coffee festival, Indonesia Pavilion will honor the first four million visitors enjoy world’s most expensive cup of coffee free. This entry was posted on Thursday, July 15th, 2010 at 5:05 pm	and is filed under Expo News. You can follow any responses to this entry through the RSS 2.0 feed. Both comments and pings are currently closed.